Today marks the twenty first Anniversary of the signing of the Good Friday Agreement. An Agreement that delivered peace and fundamentally changed relationships across the island and with Britain. It is premised on power sharing, equality and the potential for peaceful and democratic constitutional change. The people endorsed the agreement by a vast majority. It became the people’s agreement. The two governments were to act as co-equal joint guarantors; to protect and implement the agreements in full. Sinn Féin fully supports the agreements and we have met all our obligations under them. In government in the North, Martin McGuinness acted in the interests of all with great patience and generosity. When the agreements were being undermined and the institutions brought into disrepute Martin acted to call a halt to that drift. The events of Easter 1998 brought to an end decades of conflict and oppression. It has delivered real change in the lives of all our people, our economy and rights of citizens. Twenty-one years on, we need more than an absence of conflict. We should have a society at peace, equality, a return of the power-sharing institutions and reconciliation. A return to the principles and promise of the Good Friday Agreement. There are those who continue to oppose the agreement, they cannot be allowed to undermine the democratic will of all who share this Island. The DUP never signed up to the Good Friday Agreement and consistently oppose equality. We have a British government imposing Brexit and refusing to honour their obligations under the agreements. The Good Friday Agreement and its institutions are being undermined by the actions of an irresponsible British Government and a reckless DUP. We are at a defining point for the Good Friday Agreement. There are those who want to abandon it, I believe we must build on it. The political institutions, human rights guarantees, the All-Ireland bodies, and the democratic right to constitutional change by referenda north and south, must all be defended. 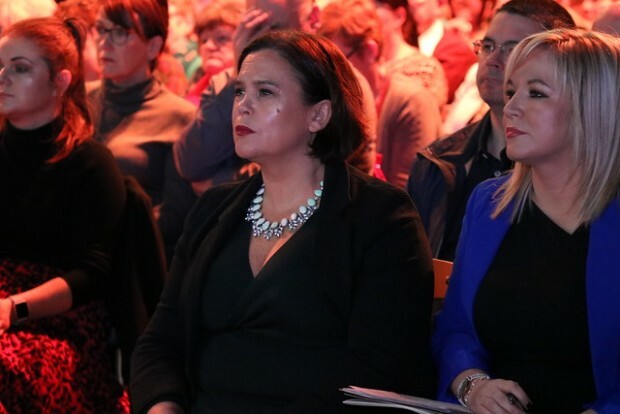 There is no contradiction between the full implementation of the Agreement, the re-establishment of the institutions and the pursuit of Irish unity. These are about dealing with today and planning for tomorrow. The institutions could and should be up and operating on the principles of the Good Friday Agreement. The implementation of the agreement and the embrace of its principles is as relevant and needed today as it was in 1998. A new conversation and public discourse is underway about Ireland’s strategic interest’s post-Brexit and our constitutional future. A referendum on Irish unity is a very real prospect within the next short number of years. A discussion on the future cannot be ignored or quelled. Twenty one years from the Good Friday Agreement it is now time to discuss the future of the entire island together. The hopes and promise of 1998 now rests in the hands of this generation. It is our responsibility to realise the democratic will of the people. The Agreement provides the way forward, the establishment of truly powersharing institutions, respect for the rights of all citizens and the promotion of reconciliation. We can build a new and prosperous Ireland a place for all our people, a place at peace with itself and with its past. The Agreement is an international agreement between to sovereign governments; both governments are co-equal and joint guarantors of the people’s vote of 1998 and of the people’s agreement. It must be honoured and implemented in all its parts. The Agreement provides for a British Irish Intergovernmental Conference. That body must meet as a matter of urgency to map the forward within the context of the Good Friday Agreement. Now more than ever we need to unlock the potential of the agreements to resolve the disputes of today and to plan for tomorrow.